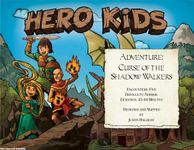 The Curse of the Shadow Walkers adventure finds the kids spending a day off at a swimming hole to the north of Rivenshore. On the way home they help a young girl to bring her runaway cart under control. She begs the heroes to help her mum and dad fight off a pack of hungry wolves, but could there be more to these attacks?